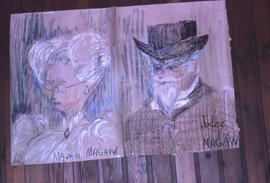 Two drawings, one of a man and the words: "Judge Magaw" and the other of a woman and the words "Mrs. Magaw"
Colour Kodachrome II 35mm slide depicts two drawings, one of a man and the words: "Judge Magaw" and the other of a woman and the words "Mrs. Magaw". 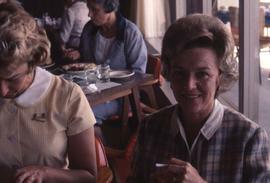 Colour Ektachrome 35mm slide depicts two unknown women sitting at a table. One of the women is looking at the camera and is smoking a cigarette. The other woman is looking down at the table. Colour Kodachrome II 35mm slide depicts an unknown man eating. There is a bowl with chopsticks sticking out of it in the foreground. Colour Kodachrome 35mm slide depicts a chalk board with the words "Calcutta Handicap" written on the top and a list of names on the left side of the chalk board. Colour Kodachrome 35mm slide depicts an unknown man wearing a cowboy hat while smoking a cigar with a beer in his hand. Colour Kodachrome 35mm slide depicts an unknown man dressed as a woman wearing a pin that says: "I'm looking for a thrill" and there is a woman sitting next to him.